It was an unusually warm weekend in Maine—I think it hit 85 degrees? My mom and I decided to enjoy the last glimpses of summer with sunset lobster rolls at Harraseeket Lunch & Lobster in South Freeport, Maine. Freeport sound familiar to you? It’s the headquarters of L.L. Bean (scored these boots) and outlet heaven. South Freeport is just 3 miles south. It was a perfect night. The restaurant has outdoor picnic benches that look out over the harbor. The sun set on the water highlighting the changing leaves in the distance. My lobster roll was amazing with big chunks in a top-split roll with fries and cole slaw. I have to say though the best sides I had this summer were at Owls Head General Store—damn good red bliss potato salad. That point doesn’t really matter Harraseeket is a pretty amazing spot but I thought I would include because I keep dreaming about it. Harraseeket has awesome homemade pie, go for the chocolate cream. Above and below photos from the night. HEY! I’ve been there! We would go to Brewers Yacht Yard right next door. Love LLBean, am I just getting older and more traditional or are their designs getting hipper? Aside from the obvious classics, i.e. barn jacket, bean boots…they really seem to have hipped things up! Nope just black flats with skinny jeans on. Sorry! ok, this comment is a bit off-topic of the post, but your shoes caught my eye— do your flats have an ankle strap? or is that just your pants? i’m having a hard time finding a nice basic pair of flats w/ ankle strap, so i just had to ask!!! Damn. This one pushed me right over the edge. We did not make it to Maine this summer, and I have been missing Harraseeket’s big-time! Oh man, I’m dying! I am 2300? miles away, west of Vail. My last meal would be a lobster roll. The pictures are beautiful, thanks. 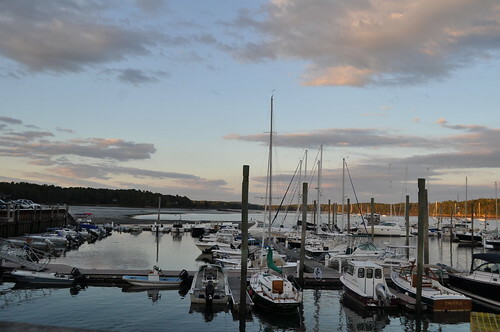 Maybe when I get back to the east in October, I should drive up to Kittery. Thanks for the tipoff about the wool blankets. They are so reasonably priced. Almost no one makes wool blankets these days. I still have a lot from LLBean, the washable ones. A few years ago I bought a lot of vintage ones on ebay. I just wash them in the washing machine . Some of my most beautiful merino and English ones were from garage sales. How scenic!!! Being from Texas, these pictures are so different than the views and scenery I see every day, so thanks for sharing! One of these days, I’m going to make it up to Maine for a visit. The new signature line just got added to the Freeport store in the last month? They don’t have everything but they do have most of the shoes. The boots are gorgeous and super comfy! being from RI and living abroad, I miss clam shacks and lobster rolls more than anything. Your pics brought a tear to my eye and a rumble to my belly. I’m so bummed I didn’t know of this place when we stopped into Freeport this summer. Definitely on my list to hit up this fall (love lobsters rolls!) Happy to know the Signature line is in the Freeport LL Bean store now — it wasn’t in July (which I thought was strange.) Great photos, Katy! Reminds me of the summer of 1996, when I spent a few weeks in Maine. This post makes me want to go back as soon as possible and eat some lobster. Absolutely love the lobster roll there! Thanks for the reminder. Love your photos. How scenic! And the food looks delicious! I just found your blog a couple of weeks ago and I am enjoying it so much. I love the posts about your old house. My husband and I totally redid an old farmhouse here in Oklahoma about four years ago, so I can relate. But I LOVE Maine. I’ve only been there once but want to go back so bad. Loved your Maine posts this week.